Iran took a significant step towards qualifying for next year's World Cup finals with a 1-0 win over China on Tuesday that pushed Marcello Lippi's team closer to the brink of elimination. Mehdi Taremi scored the only goal of the game less than a minute after halftime as Iran remained unbeaten in the third round of Asia's qualifying tournament for Russia 2018. Carlos Queiroz's team moved on to 17 points from seven games, four clear of second-placed South Korea, who got their own campaign back on track with a 1-0 win over Syria that reduced the mounting pressure on coach Uli Stielike. China, however, failed to build on last week's morale-boosting win over Stielike's side in front of a packed-out Azadi Stadium. They remain fifth in the group, eight points adrift of the Koreans, who occupy the second of the two automatic qualifying berths. "The experience of the last two rounds has shown that there is still room for us to improve," said Lippi, who took over as China coach in October. "They were two good matches, but when facing a strong side like Iran our defence needs to improve." Uzbekistan put a disappointing run of results behind them with a 1-0 win over Qatar thanks to Shanghai SIPG midfielder Odil Ahmedov's curling free kick. Qatar, who will host the 2022 World Cup finals, are bottom of the group with four points, nine outside the automatic qualification places with three games remaining. Japan confirmed Thailand's elimination with a 4-0 thumping at Saitama Stadium in Group B that strengthened their own qualifying hopes. Japan are three points ahead of third placed Australia, who picked up their first win in five games with a 2-0 victory over the United Arab Emirates, whose coach Mahdi Ali resigned after the game. 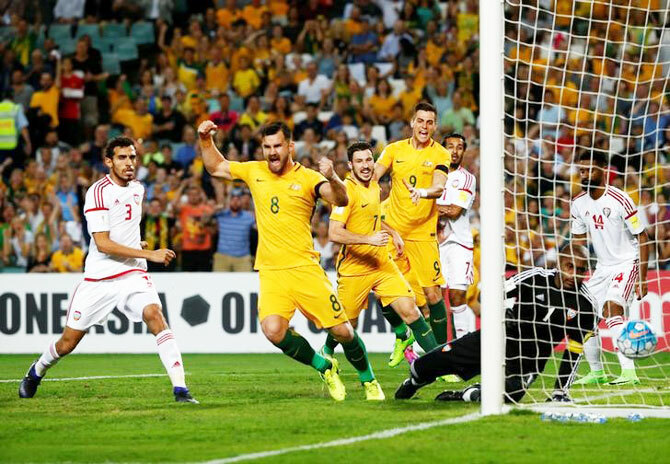 "Very proud of the players, it was a challenging 10 days for us," Australia coach Ange Postecoglou told Fox Sports. Ali stepped down after his side slipped to their second defeat in less than a week, following last Thursday's reverse against Japan. That leaves the UAE, who had high hopes of qualifying, in fourth place in Group B, four points behind the Australians. Saudi Arabia, who led the group at the start of the day, face 2007 Asian Cup winners Iraq in Jeddah in the final game of the round later on Tuesday.